October 4, 2013 - The U.S. Travel Association released excerpts of stories from America's travel community that provide a frontline picture of the damage already being done to America's travel economy by the federal government shutdown. 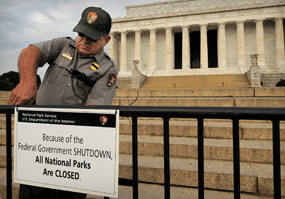 "Policymakers must understand that it's not just federal employees that are affected by the shutdown. Entire local economies are built around our national parks and historic attractions," said U.S. Travel President and CEO Roger Dow. "We're hearing from family-owned businesses who have had no choice but to send their employees home, with no idea when or if they will be able to call them back. And unlike federal workers, these workers have no expectation of getting their back pay when the government reopens." The $2.0 trillion travel industry represents America's No.1 services export, and has added jobs at a rate three times faster than the United States economy as a whole since 2010, growth that is jeopardized by the government shutdown. Even though essential travel functions like customs processing, Transportation Security Administration inspections and air traffic control are still functioning, the travel community is hurt by the mere perception that travel to and within the U.S. is uncertain. Dow says that risks destroying several years of gains in economic output and improvements in travel facilitation by the federal government. "Already you have countries like Germany telling their citizens to beware of problems and delays when traveling to the U.S.," Dow said. "With so much positive progress in place, our country doesn't need to take steps back in pursuit of welcoming millions of new international travelers. We urge leaders in Congress to realize that the longer this goes on, the worse the long-term implications will be for major portions of our economy."